Forests have been providing the peoples of Northern Eurasia with food and shelter for centuries and in turn humans have made a strong impact on the mixed and deciduous forests, especially on the East European plain. There is an ongoing debate as to whether forests of the East European plain have been impacted at the same time or later than forests of north-western and Central Europe and whether the scale of impact was similar. The first widespread woodland disruptions occurred in Britain, Denmark, Germany, France, and Sweden in the Neolithic as agriculture expanded westwards and northwards from Southern Europe (Day, 1993; Dearing, 1994; Evans et al, 1993; Lageras and Sandgren, 1994; Rosch, 1996). For a long time it was believed that because the East European plain was isolated from the centres of development2 by the nomadic cattle breeders who populated the vast steppes of Northern Eurasia, the development of agriculture was delayed and forest landscapes remained virtually untouched until the Bronze Age. The first human impacts on the forests of the East European plain were believed to be associated with the Fatyanovo culture3 (approximately 2000 вс). Tribes, who populated the vast area between the Baltic Sea and the Volga,4 lived by keeping livestock in forest clearings and along the river banks. In the Iron Age, the development of arable agriculture (Dyakovo culture which developed between the 8th-7th centuries BC and the 6th-7th centuries AD) had led to extensive forest felling in river valleys. River floodplains were particularly favoured by ancient farmers because they provided a reliable water source and silt-fed fertile land. The greatest changes occurred during the period of Slav colonization (i.e., the last 1200 years), when the exploitation of forested watersheds proceeded actively. Forest clearance was related to the development of a slash-and-burn method of farming. The burnt-over areas were abandoned after a few years of cultivation. The secondary growth was usually birch and shrubs and it took a long time for the original vegetation to regenerate. The system provoked forest fires which destroyed wider areas of forest than was intended. This slash-and-burn method was widely practised in the early Slavic history. It has long been agreed that in the western margin of the East European plain, arable agriculture developed together with cattle breeding. Already in the 1970s, Lukashev (1971) found that on the territory of modern Belarus deforestation developed at the same time as in Western Europe. Davydchuk (1975) suggested that stone axes might have been more efficient in clearing trees than it was traditionally thought, meaning that already the pre-Slav peoples, such as the Eastern Baits, could probably employ them for slash-and-burn farming. However, the most recent research (Konigsson et. al., 1997) has shown that the development of agriculture in north-western Russia was almost synchronous with that of north-western Europe and occurred in the Neolithic. In the Novgorod region, periods of arable agriculture alternated with periods of cattle breeding and this 'alternating' development continued into the Bronze and Iron Ages. Therefore, there is no difference in timing of the development of agriculture in Sweden and in the Novgorod region of Russia. This conclusion, together with the earlier findings by Lukashev (1971) and Davydchuk (1975) may lead to the collapse of the traditional view on the Neolithic on the East European plain as a period of cattle breeding. A significant interruption in the development of agriculture in the Novgorod region occurred in the early Iron Age and this break has not yet been explained. For centuries, forests were home to the Slav settlers (and other tribes) which gave them protection against the nomads of the steppes: Scythians, Khazars, Polovets, Mongols, and others. In the 13th century, after being defeated by the Mongols, the Slavs were able to recover in the forests where the nomad warriors were unwilling to settle. The forest supplied fuel, material for construction, and a range of industries. It provided berries and mushrooms and its fauna gave meat, clothing, and wealth through fur trading. Throughout history, forests remained an essential provider for a peasant household. Peasants had a right to collect dead wood in the forests owned by the aristocracy or the crown. Living wood was forbidden, but the practice of illegally killing trees was common. Hunting was strictly prohibited, but poaching still took place despite the heavy penalties (French, 1983). Forest products were a vital contribution to diet. They were abundant: yields of cowberries, bilberries, and mushrooms in the mixed forests reached 500 kg h-1 (Smith, 1977). Another important product was honey from wild bee nests in hollows of tree trunks; beeswax was collected and sold for making candles. A 16th-century Lithuanian Customs Roll, listing goods transported by the river Neman to Konigsberg (now Kaliningrad) recorded about 600 tonnes of beeswax over a six-week period (French, 1983). Detailed lists, inventories, and customs rolls, as well as extensive legislation existed, testifying to the significant economic importance of these products (French, 1983). Forests were also important to the nobility. Timber was used to construct the manor houses and palaces and to make furniture and carts. Forests were used for hunting, providing sport and meat. The privilege of hunting was strictly regulated and legally enforced. Thus, in 13th-century Novgorod, only the princes were permitted to hunt wild boar in proximity to the town (Kirikov, 1966). Fur, however, was the most valuable resource supplied by forests in medieval times and, as over-hunting depleted the forests of the European territory, it was the search for new supplies that was the prime incentive for the advance to Siberia. In the Middle Ages, the principal practice of arable farming in Russia was the 'long-fallow' system. It involved cultivating a patch of land for several years, abandoning it after fertility ceased, and moving on to another strip of land. Similar to the 'slash-and-burn' method, the system was extensive in nature and destructive to forests. Following the Mongol invasion, many fields were abandoned and became overgrown. In the 14th and 15th centuries, when conditions stabilized, many of these fields were ploughed up and forest clearance was therefore delayed. However, when forested areas of the Cis-Volga region were colonized by Russian settlers following the defeat of the Kazan Tartars in 1552, the clearance of forests in this area (as well as in Central Russia) proceeded rapidly and continued unabated into the next century, extending further to the southern limits of the forests (French, 1983). Although in the 16th century a more economical method of farming, crop rotation with fallow (the so-called three-field system), became widely used, land for cultivation continued to be taken out of the forested areas at an escalating rate. Between 1696 and 1796, in 12 of the 16 provinces of the mixed forest zone, the woodland was reduced by 47 000 km2, so that instead of 61 per cent of the land being forested, only 53 per cent was. The arable land increased proportionally (French, 1963). By the time of the General Survey of 1776-1800, between 60 per cent and 75 per cent of the northern forest-steppe had been ploughed up (French, 1983). The expansion of farming was complemented by non-agricultural demands for timber. Military campaigns (most notably Ivan the Terrible's capture of the Volga cities of Kazan and Astrakhan) required timber for the construction of boats. The emergence of new towns intensified woodland exploitation as more wood was required for construction and heating. Already by the 16th century, building timber had been largely exhausted in the vicinity of Moscow (French, 1983). Industrial innovations occurred. Most importantly, the Tula iron works were established in 1632. Most iron works in Central Russia were rurally based, taking advantage of the availability of charcoal from woodlands. The production of potash was another lucrative and timber-demanding business practised across the East European plain. For example, the Lithuanian Customs Roll already cited recorded 460 tons of ash and fifty barrels of potash being sent to Konigsberg (Kaliningrad) (French, 1983). Berdnikov (1995) describes the production of potash (controlled by the state treasury since it generated considerable income) in the forests of the middle course of the Volga which in the 1620s occupied about 70 per cent of the area. Specific trees were used, such as oak, elm, maple, and lime. The profits of the potash business declined with the extinction of woodland and a number of forest inventories were ordered to assess the decline, reflecting the importance of the industry. In 1662-3 about 3000 tons of potash were made in Russia. To make a kilo of potash required three cubic metres of wood, or about a 1000 tons of timber to 1 ton of potash (French, 1983). This statistic well illustrates the intensity of woodland exploitation. Another widespread use of wood was for salt production. Wood was burnt to provide heat for salt evaporation. Salt production by evaporation was developed in a number of regions following the establishment of the Kievan state (originally in the forest zone and later in the forest-steppe) and place names indicative of salt production, reveal the importance of the business. With the techniques of the 15th century, it was necessary to burn about 60 m! of timber to produce a ton of salt. Although with time efficiency improved, and in the 17th century approximately 48 m3 of timber per ton of salt were required, the overall production also increased creating a higher timber demand (French, 1983). 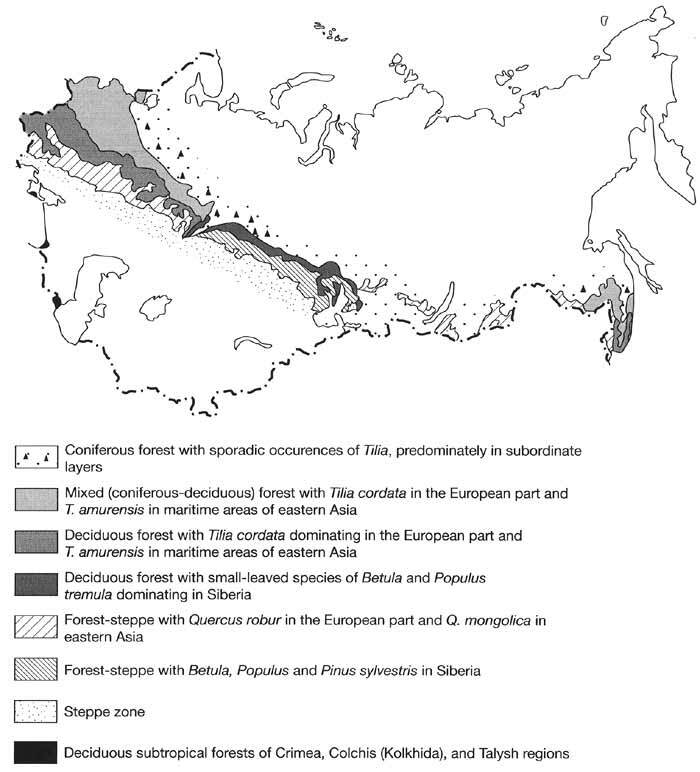 In contrast to Western Europe, where woodlands declined throughout the Middle Ages (Mannion, 1997), it was the development of the Russian state in terms of area, population, and economic growth during the 16th and 17th centuries that prompted extensive forest clearance. In the 18th and 19th centuries, development of agriculture and industry accelerated further. Economic growth and, consequently, deforestation are associated first and foremost with the reign of Peter the Great. Russia's seagoing navy was founded, thereby intensifying the pressures on forests (oak was particularly sought after for construction of ships). There were a number of shipbuilding centres and the most important one was, of course, the new capital, St. Petersburg. The construction of the city itself consumed enormous amounts of timber and firewood (although it was supplied from the taiga regions). After the armament factories were set up in Tula in 1712, the ancient Tula Zaseki became subject to increased deforestation (French, 1983). The iron and copper industries were established in the Urals. Although wood for these factories was supplied from the taiga, it is worth mentioning that at the beginning of the 18th century, the Urals industry consumed nearly 5 million m3 of wood annually and at the end of the century, when the Urals became the greatest heavy industrial region of the country, three times as much (French, 1983). As extensive logging continued, concern about availability of timber resources mounted. A number of laws aimed at the protection of forests were adopted under Peter the Great and special officials, the Wddmeisters, were appointed to supervise their implementation. In the middle of the 18th century, woodlands were intensively managed and subject to conflict of interest. For example, small iron works near Moscow had to be closed down in order to conserve forests (Lappo, 1961). The Industrial Revolution began in Russia later than in Western Europe (i.e., not until the 1870s). Changes in energy provision (the switch from wood to coal) and technological innovations (replacement of wooden ships by iron steamers) provided a respite for the forests. However, in contrast to Western Europe, a large number of small-scale enterprises, based in the countryside, existed in Russia alongside the emerging large urban and industrial centres throughout the 19th and at the beginning of the 20th century. For the small-scale industry, as well as for the predominantly rural population, wood long remained (and locally still remains) the principal fuel. The first systematic attempts at reforestation in the state-owned forests date back to the middle of the 19th century. Market requirements for timber were very high and private owners readily sold off their forests. To regulate loggings at private estates, by the end of the century private owners had been made to comply with the state regulations.